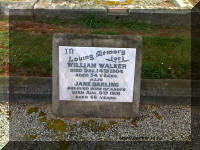 2-William Walker was born on 8 Dec 1850 in Four Springs Plains, Exton, Tasmania, died on 14 Dec 1904 in Whitefoord Hills, Elizabeth Town at age 54, and was buried in Dec 1904 in General Cemetery, Deloraine D101/523. William married Jane Darling Brown, daughter of John Brown and Margaret Foreman, on 18 Apr 1873 in Osmaston. 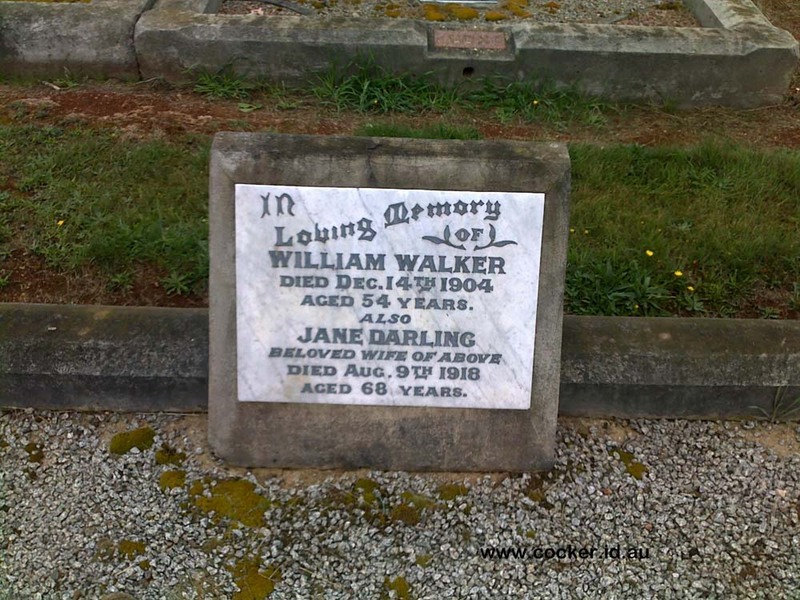 Jane was born on 3 Mar 1850 in Coldstream, Berwickshire, Scotland, died on 9 Aug 1918 in Tasmania at age 68, and was buried in Aug 1918 in General Cemetery, Deloraine D101/523. William walker, ninth child and seventh son of Michael and Sarah, was born at Four Spring Plains, Exton, on 8th December, 1850, just one year later then the accidental death of their eldest child, also called William. Little is known of William's childhood. On 18th April, 1873, he married Jane Darling Brown at Osmaston, near Exton, the witnesses being Michael Walker and Mary Green. Jane Darling Brown was born in Scotland on 3rd March 1850. 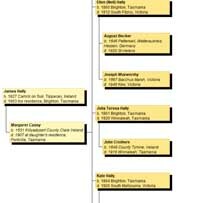 She was the eighth child of John and Margaret Brown, nee Foreman, who had left Glasgow with their family on 16th June, 1955, to migrate to Tasmania. After a voyage of ten weeks on the ship Storm Cloud they arrived off George Town on 24th August. They remained in George Town until 31st August, when a smaller vessel conveyed them to Launceston. John and Margaret eventually took up farming in the Whitefoord district, and are also believed to have spent some time at Osmaston and Cluan, moving thence to Adelphi, then to Hill Top, near Deloraine. Sarah and Michael Walker are believed to have had farming interests in surrounding districts. Older cousins have made occasional reference to relatives from the Goss branch as "living beyond Quamby Brook". It is believed that William and family left Kindred about the middle of 1886, presumably moving to Blackmoor (Weegena). William, we understand, owned a 50 acre lot back from the road and leased a further 50 acre lot with road frontage. We understand he purchased a portion of the 50 acre lease for the purpose of building a Methodist Church. As the church was opened in 1888 and William was closely associated with it until his death (1904) we assume he moved from Kindred to Blackmoor (1886). Some time after William died, his wife Jane and family, still at home, moved to a property at Dunorlan owned by Mr. Fair, who owned the Dunorlan store and farms in the district. (May have had managers on the farms.) It would appear that Percy, Alvin and Ella were with their mother about this time, being in their teens. William and Jane's first five children were all born at Westbury, and the next two at Kindred. It is believed that Wilfred was about three months old when they moved to Blackmoor, now Weegena; their residence would actually have been nearer to Kimberley. Another three children were born there. 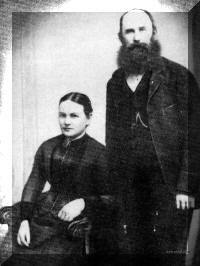 William and Jane were ardent workers for God in their area. It is believed William provided the land for the Blackmoor Methodist Church. The pulpit bible used in that church until its closure was presented by Michael Walker at the opening in 1888. William was Sunday School superintendent, trustee and church steward until his untimely illness in 1904. A scroll in honour of his services was presented to him on 5th December, 1904, although it is doubtful if he was able to personally accept the presentation as he had suffered a paralytic stroke from which he departed this life on 14th December, 1904.